A sort of town square for the funky East Village neighborhood that it serves, Tompkins Square Park marks a gathering point for an eclectic mix of urban dwellers, doubling as a primo perch for NYC people-watching. Come on any given day to take in the hum of activity: Watch dogs of all shapes and sizes frolicking about the popular dog run, see energized kids swarming the playgrounds, catch a drum circle in full swing, stumble upon a political rally, or take in a heated basketball or handball match on one of the designated courts. The green and clean scene represented here today, however, gives few hints of Tompkins Square Park’s long and volatile history. Over the last 30 years alone, the park’s transformed from a seedy hotbed for homeless squatters and drug dealers — and due to rampant and controversial neighborhood gentrification and redevelopment — into the backyard jewel of the yuppified East Village. The square-shaped, 10.5-acre Tompkins Square Park is located within the Alphabet City section of the East Village, and is bordered by Avenue A and Avenue B, between East 7th and East 10th streets. Named for 19th century New York State governor and U.S. Vice President (under James Monroe) Daniel Tompkins, Tompkins Square Park’s colonial history dates back to the 17th century, when it was acquired by Peter Stuyvesant, the last director-general of the then Dutch colony of New Netherland. Obtained by New York City in 1834, it was landscaped with trees and transformed from marshland into park space, then into a military parade ground, and, ultimately, back into a public park, which it’s served as continually since 1878. The green space, set within the midst of blocks of working-class tenement buildings, quickly became not just a place of recreation, but a point for public protests and rallies, serving as a barometer of sorts for measuring urban tensions du jour. Here, New Yorkers have aired grievances ranging from 19th century woes about the stagnant economy, unemployment, and military drafts (including the 1863 Draft Riots and 1874 Tompkins Square Riot) to Vietnam War protests in the 1960s to more modern-day concerns about neighborhood gentrification in the 1990s and 2000s. By the late 1980s, the park had earned a reputation as a gritty no-go zone, serving as a de facto homeless encampment, outdoor drug den, and crime zone. By the early ‘90s, the homeless had been evicted, a park curfew had been enforced (it still closes at midnight daily), and Tompkins Square Park saw a massive cleanup and renovation project ensue, including the installation of a dog run and new playgrounds. 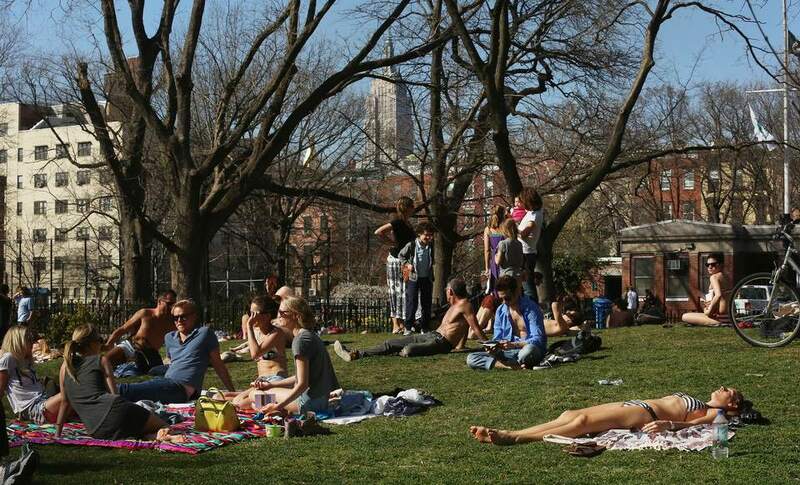 Today, the park has come a long way to serve as an enjoyable haven for locals and tourists alike, despite ongoing concerns about the increasing gentrification of the East Village neighborhood that surrounds it. Leafy Tompkins Square Park comes packed with recreational facilities, including basketball and handball courts, fitness equipment, two lively playgrounds, chess tables, a mini public swimming pool for kids, and a popular dog run that was the very first in the city when it opened in 1990. The run comes with amenities like doggie swimming pools and hoses, a tree deck, picnic tables, and separate sections for dogs big and small. The park also has plenty of benches, and is equipped with Wi-Fi and public bathrooms. Tompkins Square is noted for its towering old sycamore and shade-giving American elm trees. Of special interest, keep an eye out for the Hare Krishna Tree (set at the park's center, near the semi-circular arrangement of benches), which is of significance to the Hare Krishna faith. The tree was the site of chanting sessions in 1966, led by the movement’s Indian founder A.C. Bhaktivedanta Swami Prabhupada. The moment is considered to be the founding of the religion in the U.S., and the event attracted the likes of Beat poet/philosopher Allen Ginsberg. Notable Tompkins Square Park monuments and fountains include a statue depicting 19th century NYC politician and U.S. Congressman Samuel Sullivan Cox (1891), best-known for championing postal worker causes and establishing a Life Saving Service, which later merged with the U.S. Coast Guard; a 1906 memorial fountain to the General Slocum boating disaster of 1904 (in which more than 1,000 NYC-area passengers, mostly German immigrant women and children, perished – marking the single greatest death toll in the city prior to the 9/11 attacks); and the neoclassical Temperance Fountain, dating to 1888, which was installed as part of a nationwide movement to encourage citizens to choose fresh, clean drinking water over alcohol. Tompkins Square Park hosts numerous events throughout the year, including a year-round farmers’ market (the Tompkins Square Greenmarket) that's conducted each Sunday in the park's southwest corner. Summertime sees special events put on by the New York City Department of Parks and Recreation, including free outdoor screenings of French films. Among the complimentary major annual events to mark your calendar for in the park: the Charlie Parker Jazz Festival (the jazz great once lived nearby), which is held each August; the community-based music and arts fest, New Village Music Festival, also held in August; and the Tompkins Square Halloween Dog Parade in October, cited as the biggest Halloween party for dogs in the world (swing by to see more than 400 dogs in costume). On Sundays, the weekly Tompkins Square Greenmarket is a great spot to pick up picnic-ready grub sourced from regional farmers and producers, including fresh-from-the-orchard fruits, farmstead cheeses, and artisanal breads and baked goods. Or, venture just outside the park for quick grab-and-go eats from quality spots like Tompkins Square Bagels (165 Ave. A), known for their hand-rolled bagels; Superiority Burger (430 E. 9th St.), for vegetarian fast food; or Big Gay Ice Cream Shop, for one of the city’s best ice cream shops (125 E. 7th St.). For sit-down fare, the park’s perimeters offer several solid choices, boasting seasonal patios overlooking the park, to boot: Try pizza and pasta dishes from Gnocco (337 E. 10th St.) or pan-Latin fare from Yuca (111 Ave. A).